North Carolina Central University (NCCU) is a public, four-year coeducational historically black liberal arts university located in Durham, North Carolina. The small urban campus is located 23 miles from Raleigh, North Carolina. 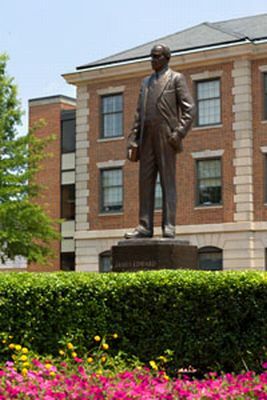 North Carolina Central University was founded in 1910 by Dr. James E. Shepard. The school was chartered in 1909 as a private institution, and opened the next year. When chartered, NCCU was called the National Religious Training School and Chautauqua. In 1923, the school was purchased by the General Assembly of North Carolina, at which time the private school was turned into a public institution. NCCU awarded its first baccalaureate degree in 1929. The college went through several name changes before settling on its current name in 1969. In 1972, NCCU became a part of the University of North Carolina. Accredited by the Southern Association of Colleges and Schools, North Carolina Central University offers a plethora of courses and areas of study. Undergraduate studies are taught in 26 different areas, ranging from education and aerospace studies, to science and math and history. The school also offers extensive graduate studies. NCCU also gives students access to evening and weekend degree programs, distance learning, and continuing education. The university houses three colleges (College of Behavioral and Social Sciences, College of Liberal Arts, and College of Science and Technology) as well as five schools (School of Education, School of Law, School of Nursing, School of Business, and School of Library and Information Sciences). North Carolina Central has a number of coveted awards, including the number one historically black college or university (HBCU) in the state of North Carolina, the number one public HBCU, and the number ten overall HBCU according to U.S. News and World Reports. Fall 2009 enrollment at North Carolina Central University was approximately 9,000 students, both undergraduate and graduate students. International students come from more than a dozen different countries. After being open for a century, NCCU has many notable alumni, including former North Carolina Governor Mike Easley and former Atlanta Mayor Maynard Jackson, Jr., both of whom earned J.D. degrees at NCCU Law School, former coach and player in the Harlem Globetrotters Charles “Tex” Harrison, and editor-at-large of Vogue Magazine André Leon Talley. North Carolina Central also has many former and current sports star alumni, including track athlete Jason Smoots, and NBA hall of fame member Sam Jones. North Carolina Central University Webpage, http://www.nccu.edu/; Toni Hodge-Wright, The Handbook of Historically Black Colleges and Universities (Seattle: Jireh and Associates, 1992); Julian B. Roebuck and Komanduri S. Murty, Historically Black Colleges and Universities: Their Place in American Higher Education (Westport, CT: Praeger Publishers, 1993).